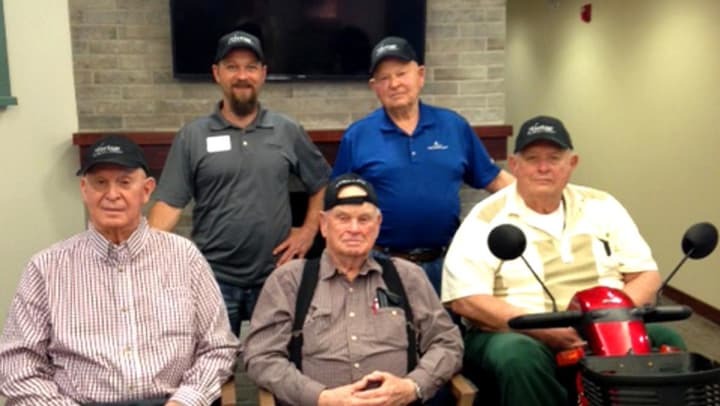 Retired men have the opportunity to travel and reminisce to the old days through the ROMEO Club established by The Heritage at Meridian Gardens. Feik said The Heritage in Columbus is the only one in the country with this club. He took over the operations eight years ago and said it had been running for years before that. ROMEO Club stands for Retired Old Men Eating Out. Once a month, club members gather to travel to different communities to have dinner. On average, the club attracts eight to nine residents every month. “We really try hard to get them to join,” Feik said. Feik said the outings helped numerous residents step out of their shells. He has encountered residents who were normally timid within the assisted living facility learning to be more outspoken during the trips. “Once they go then they usually will go every month after that,” he said. The upcoming get-together is on Wednesday to Leroy's Steakhouse in North Bend. The group previously traveled to Genoa, Shelby, Creston and Richland. “We are always open to looking at new food places that would be interested for us to go to,” Feik said. Before each trip, Feik surveys different communities for eateries with handicap-friendly environments to accommodate members in wheelchairs and with walking sticks. Feik and driver Kurt Spitz accompany the group for every trip to not only making sure everything goes smoothly but to socialize with the men. “We always tell them what happens on the ROMEO Club, stays in the ROMEO Club,” Feik said. Feik said a number of members consist of retired farmers so, at every location they visited, they always had a tale to tell. Feik said the ladies at The Heritage gather once a month, as well, but they tend to remain in the Columbus area. This group is led by program director Cindy Gasper. Due to Nebraska’s fluctuating weather, especially in the winter, Feik said it can be tough to plan the outings. He said the club is especially beneficial for new residents because it provides the opportunity to familiarize themselves with other occupants. The members also oftentimes include their family members in the trips. Feik encourages more male staff to participate and to be more acquainted with the residents. “It makes it interesting too because then you’ve got more people talking about different things going on,” Feik said.